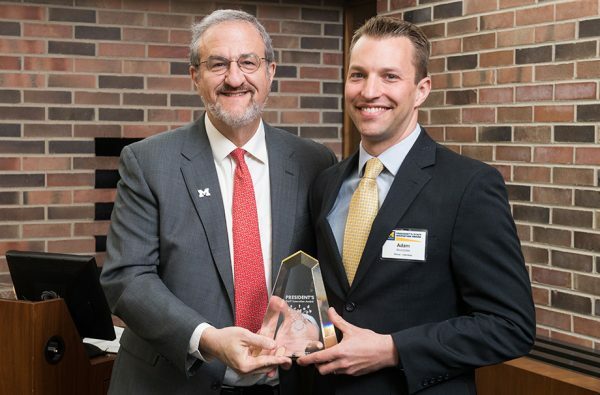 Adam Skoczylas, program manager for the Center for Educational Outreach, was named the individual winner of the 2018 President’s Staff Innovation Awards. Skoczylas received the award for his leadership in the creation of Youth Hub as well as the redevelopment of Children on Campus program registry, including a shared database of these programs. Youth Hub is a technology infrastructure that supports and strengthens educational outreach for summer and youth-serving programs across campus. Betty Thomas, benefits administrator senior, was an individual award finalist for improving the accessibility of retirement information for employees by offering virtual appointments using web-based technology via BlueJeans. “Staff members across our campuses contribute to excellence on many levels. The inventive thinking taking place here at Michigan is proof that as we begin our third century, we are well-prepared to meet the challenges ahead,” said President Mark Schlissel in presenting the awards Monday, May 7.